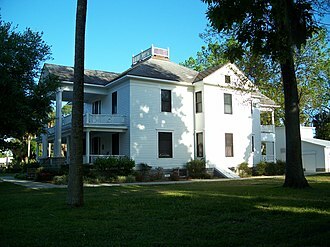 There are more than 1,700 properties and districts listed on the National Register of Historic Places in Florida. They are distributed through 66 of the state's 67 counties. Of these, 42 are National Historic Landmarks. The following are approximate tallies of current listings in Florida on the National Register of Historic Places. These counts are based on entries in the National Register Information Database as of April 20, 2018 and new weekly listings posted since then on the National Register of Historic Places website. There are frequent additions to the listings and occasional delistings and the counts here are not official. Also, the counts in this table exclude boundary increase and decrease listings which modify the area covered by an existing property or district and which carry a separate National Register reference number. ^ "National Register of Historic Places: Weekly List Actions". National Park Service. Retrieved April 20, 2018. 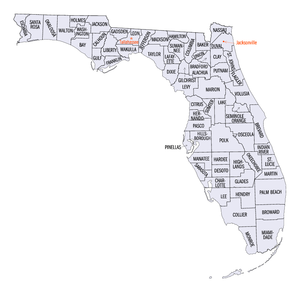 ^ The count for St. Johns County includes Florida's two National Monuments. ^ The following sites are listed in multiple counties: Dixie Highway-Hastings, Espanola and Bunnell Road (Flagler and St. Johns) and Melrose Historic District (Alachua and Putnam). 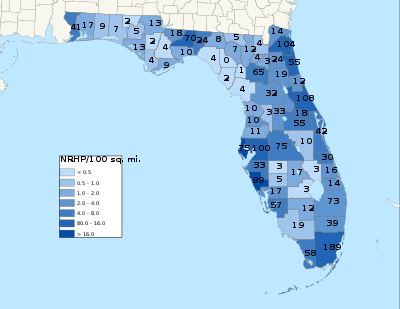 Wikimedia Commons has media related to National Register of Historic Places in Florida.